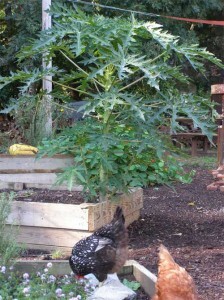 Palmately dissected leaves of papaya attract attention in Johnny’s garden. Photo by Ken Moore. Though it’s sometimes called pawpaw, it can’t be confused with our native pawpaw, Asimina triloba, so frequently encountered along our stream corridors. The leaf of the tropical pawpaw, more commonly called papaya, Carica papaya, is deeply palmately lobed and dissected, looking more like a buckeye tree leaf having a bad hair day. Papaya is a delicious tropical fruit-bearing plant that I haven’t seen since a visit to frost-free areas of southern Florida years ago. So what’s it doing outdoors here in Carrboro? Some of the local folks visit the plant in wonderment on a daily basis. So where can you see it? Go to Johnny’s on Main Street in Carrboro, halfway between the fire station and the post office. One of Brian Plaster’s staff at Johnny’s, Genero Rodriquez, buried a whole overripe papaya in a corner of one of the raised garden beds out back late last fall. A few months ago, it started to emerge from beneath the tomato and pepper plants and is now showing off with cream-colored flowers and green baby papayas that sadly fall off before ripening. Papayas, by nature, come in separate male and female plants, and, like our native persimmon and holly trees, you have to have both sexes around. Otherwise, we can’t look forward to persimmon pudding in the fall or red holly berries for holiday decoration. 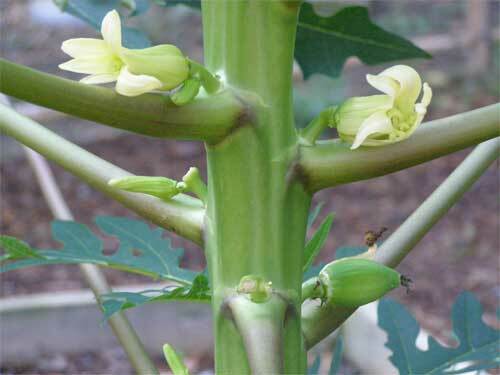 Though there are some papaya cultivars that have perfect flowers, bearing both male and female parts, Johnny’s single plant is not one of them. That papaya is not going to produce ripe fruit, and it is not going to survive the frost that will eventually arrive. Even though it’s the beginning of October, you most likely will have several more weeks to be one of the many visitors to view Genero’s papaya at Johnny’s. Take the kids by for a visit. I would love to have just a hint of the thoughts in the heads of some of the youngsters I’ve seen gazing up from beneath the giant leaves of that papaya plant during the past couple of weeks. Of South American origin, domestication of papaya most likely began in the Amazonian basin. It is a common breakfast fruit in much of the tropics. In addition to the fruit, the seeds are edible, credited with having a flavor a bit like watercress, and the tender leaves are prepared like spinach. Without a male plant close by, these female papaya flowers will never produce a mature fruit; the young fruit shown at lower right will soon drop. Photo by Ken Moore. Unripe fruit and the leaves are credited with producing an enzyme that is used as a dietary supplement to aid digestion. It is also used as a component in meat tenderizers and, perhaps of interest to some Carrborites, used to prevent cloudiness in bottled beers. In future years, as our growing season becomes longer, Johnny’s may have more than one papaya plant growing, with a better chance of both sexes being present, and a greater opportunity for ripe fruit here above the tropics.